This book was given to me by B, an ex. He once said that I reminded him of the central character, Madame Renee Michel, a concierge for an upscale apartment in Paris, who has a rich hidden life devoted to philosophical musings, good books, great art and culture, which belie the image she presents to the world — fat, grumpy, addicted to bad TV. Given that description, I don’t know if I should be insulted or not. But no matter. We didn’t last, but I would always be grateful to him for giving me this book and introducing me to Barbery. The book turned out to be the keeper and I’m glad of it. King takes on the hoary sci-fi trope of time travel, but this doesn’t feel clumsy or over-the-top, the way King can sometimes get. I lost a weekend reading this, and I’m glad I jumped into the rabbit hole to begin with. The premise of the book is of the classic, “If you could go back in time to kill Hitler, would you do it?” In the book, Jake Epping goes back in time, not to kill Hitler, but to prevent the Kennedy assassination, an event that changed the course of America’s history towards a darker path, as a character in the book believes. Won’t spoil how the story went down, but like most of King’s books, this one is a page-turner. Actually, it’s the whole five books (so far) of A Song of Ice and Fire (ASOIF), I just couldn’t find where the other books are, so only one is represented in the stack! I’ve known about ASOIF way before but just didn’t want to add another series to my increasingly heavy book debt. But then HBO debuted Game of Thrones, and how could I not after that? This series basically stole a year-and-a-half to two years of my life. I don’t begrudge GRRM a second of it. If only he can get on with the next two (or is it three?) books! C’mon, George! I don’t exactly remember how I came to read this book. But I’m glad I did. Augustus Waters and Hazel Grace just totally destroyed me! I don’t know of any real teenagers who talk — and think — like these two, but I would like to think that I had a bit of their precociousness and maturity when I was their age. Here’s what I wrote about this book when I was reading it. Besides, any book that makes me able to converse and keep up with teens, like my goddaughter, deserves a place on this list. Speaking of said goddaughter, she rattled off a list of all the John Green books that I should be reading/have read when I mentioned this to her just to show that I was a hip adult! I still have not read the other books by John Green. Three words: Monumental book debt. Who doesn’t love a do-over? Kate Atkinson takes this concept and turns it on its head in this Groundhog Day-slash-Sliding Doors-ish tale of a woman who keeps repeating her life over and over again, by dying — literally being born again — every time she makes a monumental mistake. At first the story gets repetitious as chapters of Ursula Todd’s life gets, er, replayed again and again, but after awhile, the tale gets engrossing and I found myself muttering, “Please, just die already!” so she could make a clean start. How many heroines of novels do you want to die so they could finally live the life they were meant to? The story of feckless, reckless Yunior and the women he loves and loses. At first I didn’t think I could get into the romantic foibles of a Latino guy, but Yunior is so charismatic and his misadventures funny/poignant that it’s hard not to root for the guy. By rights, Gone Girl and Sharp Objects should also be included in this stack but I couldn’t find my copies, so only one book is represented. At their simplest, these three books are thrillers. But what I love about them is that they’re really character studies of deeply flawed and hard-to-like protagonists. You’re not going to love her heroines — you’ll even hate them and sometimes be disgusted at their choices — but they’re no less compelling for all that. Flynn writes her characters like she’s making pen and ink portraits — the dark and light parts fighting for dominance and that’s what makes the books compelling. Goodness, I must have gone on and on about Gone Girl when I first read it and it’s still one of the books that really stayed with me. Of all the books on this list, this is the one that’s laugh-out-loud funny — maybe because De Veyra’s observations are so inherently Filipino and spot on, that they strike me in the gut. You know how we say that cuss words have a really deeper impact when said in your native language (which in my case, is Filipino)? This felt the same. The language is easy and reads like how one converses in Filipino — part English, part Tagalog and street slang and full of funny observations about life in the Philippines. Reading this collection of De Veyra’s blog for spot.ph, I keep wishing that there was an all-English translation just so I could give it to non-Filipino friends but something would get lost in the translation, for sure! This book made me homesick. This was a cold contact book for me. I really just picked it up because I liked the cover. But to my surprise, it proved to be a delight to read. The story is simple: A librarian discovers a reader has been locked in overnight when she opens the library the following day. She starts to talk to him, and the book is a one-way conversation — a monologue, really — that soon meanders into frustrations, observations, insights about the world, books, literature, love and other things. From the conversation, we find out that the librarian likes a quiet researcher named Martin (hence unrequited because she has not talked to him) and her love for books. It kind of resonated — especially her love for books, because God knows, I can natter on about books when I choose to (as this post shows!). Atwood knows her way around a dystopia, I have to say. The first Atwood book I’ve ever read was The Handmaid’s Tale, and while these two books are not in any way similar, they do offer a glimpse into a society that has gone through great upheaval. This is book two of Atwood’s MadAddam trilogy, in which we read about the aftermath of a biological disaster (the flood in the title). I have not read Oryx and Crake, the first book. I really just picked this up because I liked Atwood and liked the first page when I was browsing through this in the bookstore. This book focuses on the God’s Gardeners, a marginalized “sect” dedicated to preserving plant and animal life. Reading this, I don’t get why this was the “second” book when it read like a stand alone. But I have since discovered that it basically describes the same events as the first book but from the point of view of the lower classes (the pleebands). All right then. I am always up for getting lost in a good story and Atwood will just let you dive in and feel your way around. 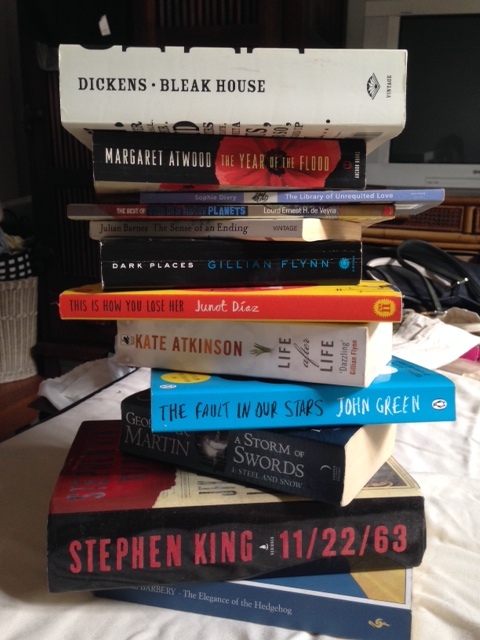 Supposed to be 10 books, but had to put in 12 because, well, I couldn’t stop at 10! Don’t take too long to think about it. Ten books you’ve read that will always stick with you. First 10 you can recall in no more than 10 minutes. Tag 10 friends, including me because I’m interested in seeing what books my friends choose. 1. IT (Stephen King) The book that really got me into “the master.” It also told me that friendships formed in childhood are very powerful and have the most impact on us as adults, whether we remember them or not; whether we stay friends with them or not. 2. Different Seasons (Stephen King) Horror and literary genius can co-exist. 4. Blue Moon (Laurell K. Hamilton) Essentially, detective noir about vampires, werewolves, and other things that go bump in the night. Heaps of fun. 5. The Wars of the Roses (Alison Weir) English history that reads almost like really cool historical fiction. 7. Days of Disquiet, Nights of Rage (Pete Lacaba) Still the best first-person account of the First Quarter Storm, a time of great upheaval in the 1970s in Manila. Back then, students had sit-ins and demonstrations against the Marcos dictatorship. It was a dark time as well because students were being jailed and classified as political detainees or fled to the mountains to join the New People’s Army, the militant arm of the Communist Party of the Philippines. The country must have lost a significant chunk of its intelligensia during this time. The book is also a great template for writers on how to write a first-person news narrative. If I were stuck in the frontline of some war and have to write about it, this is the kind of writing I’ll be aiming for. 8. Dateline Earth: Journalism As if the Planet Mattered (Kunda Dixit) This book was used as supplementary reading when I was in college and it stuck with me. Before Al Gore popularized the idea of climate change, environmental concerns and the politics that went with it, as well as how media (Western and otherwise) portrayed the news and the way we write articles, this opened my eyes that news was relative and the way we handle news is relative. A whole country might be wiped out in a flash flood because it cut too many of its forest reserves but if it occurred somewhere in, say, Nepal, Laos or the Philippines, it will not be big news, compared to say, the yearly forest fire in California. Sad. 10. The Sparrow (Mary Doria Russell) Very complex and compelling book about what it means to be “human,” the notion of “faith,” the search for God and beings “out there,” and explores the idea behind Star Trek’s Prime Directive: non-interference. Very heartbreaking! If you read this, you have to read the sequel Children of God. 11. Any Amanda Quick novel. Because any list should have lighthearted romantic fiction. Why? Because it’s fun. 12. World War Z (Max Brooks). You’d think a book about zombies should read like total schlock, but it doesn’t. It’s almost anthropological the way the writer presents a case of zombie infestation. A zombie novel at its most basic, this also realistically shows how an epidemic spreads and how different countries and individuals deal with it and its aftermath. This is what happens when you don’t blog for months… so many words come spilling out, haha! The Fault in Our Stars, really? I was surprised with that one in your list…was never compelled to read it, now I might just….but have to get through some other titles first from my own book debt. PS. You lent me Gone Girl (after Pierra) and I gave it to a person in Yahoo flying to SG to give to Karen. It never made it? Eeep! Next Next post: Well, I’m back….